34 mm 18K white gold case set with 52 diamonds (approx. 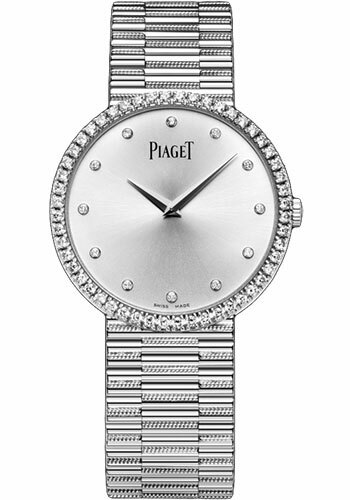 0.8 ct), 5.2 mm thick, diamond bezel, silvered dial set with 12 diamond hour markers (approx. 0.1 ct), 430P manual movement, approximately 43 hours of power reserve, 18K white gold bracelet, integrated buckle. Water resistant to 03 ATM. 34 mm 18K white gold case set with 52 diamonds (approx. 0.8 ct), 5.2 mm thick, diamond bezel, gem set dial with 492 diamonds (approx. 1.6 ct) with hour markers set with 12 sapphires (approx. 0.1 ct), 430P manual movement, approximately 43 hours of power reserve, 18K white gold bracelet, integrated buckle. Water resistant to 03 ATM.